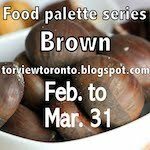 What is Brown Rice ? Brown rice is also called 'unpolished rice' and is brown in color. Brown rice is a complex carbohydrate that provides 15 essential nutrients, including B-vitamins, niacin and potassium. It is actually how all rice would look before it goes through the entire process of polishing. Every rice grain has an outer layer of a slightly stiff cover called the 'hull' or husk. The husk is always removed from the seed for both white and brown rice. Under this layer is a thin brownish layer called the 'bran' layer. This brownish layer on the rice seed clings to the seed and is removed through a polishing process. In the case of brown rice, the brownish bran layer is left intact and only the top stiff cover is removed. Brown rice is believed to be more nutritious as compared to white rice as, there are many nutrients in the brown layer that normally get taken off in the polishing process. Brown rice is every weight watcher’s dream food. A common sense approach to obesity control is to eat foods that have low glycemic index(GI), like raw vegetables and fruits and whole grains. Brown rice has antioxidants and phytonutrients that boosts the immune system, lowers cholesterol, reduces risk of heart disease, stroke and colon cancer and reduces severity of asthma. Brown rice can substantially reduce the risk of colon cancer, as it is a a very good source of selenium, a trace mineral that induces DNA repair and synthesis in damaged cells and inhibits the proliferation of cancer cells. Brown rice is a concentrated source of fiber; so it minimizes the amount of time cancer-causing substances spend in contact with colon cells. Brown rice is an excellent source of manganese and magnesium as well. Just one cup of brown rice will provide you with 88.0% of the daily value for manganese. Magnesium reduces the severity of asthma, lowers high blood pressure, reduces the frequency of migraine headaches, and reduces the risk of heart attack and stroke. With a diet low on magnesium, calcium can gain entry into the nerves and overactivate it. Magnesium helps regulate nerve and muscle tone by blocking the entry of calcium into the nerve, preventing its contraction and keeping it relaxed. Besides, Magnesium is necessary for healthy bones as well. I try to add brown rice in my family's diet as often as possible. 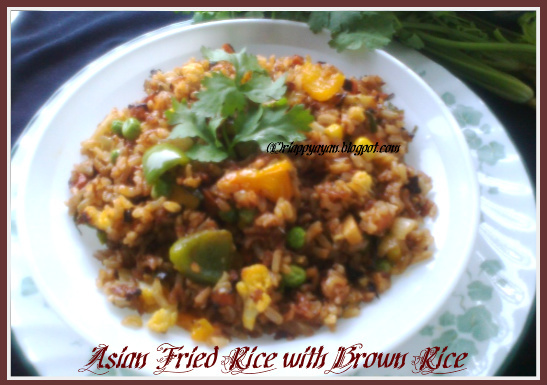 This Fried rice I often make for some quick, one-pot meal lunch and it tastes really good. Tomato paste/puree : 1 tblsp. Lime juice : 2 tblsp. Soak brown rice in warm water for about 30-45 minutes and then cook in enough water until almost done. It should not be over-cooked. Brown rice takes little more time than white rice. Drain water and keep aside. Heat oil in a pan, if using the shrimps, lightly fry them from both sides and keep aside. In the same oil, fry carrot, cauliflower, green beans and peppers, until they are done. Keep aside. Keep about 2 tblsp. oil in the pan, add onions and fry until lightly brown, then add ginger, garlic and red chilli, stir for few minutes, then add frozen corn and green peas, stir fry for 1-2 minutes. Make a gap in the center of the pan, add beaten egg. Scramble the egg, stirring occasionally and then stir the egg into the vegetables. Add fried vegetables and shrimps. Then add tomato paste, hot sauce and lime juice. Stir well to combine. Increase the heat and add cooked rice, fresh cilantro and seasoning(salt and black pepper) as per your taste. Stir fry for 3-4 minutes, until piping hot. Serve garnished with fresh coriander leaves/cilantro. 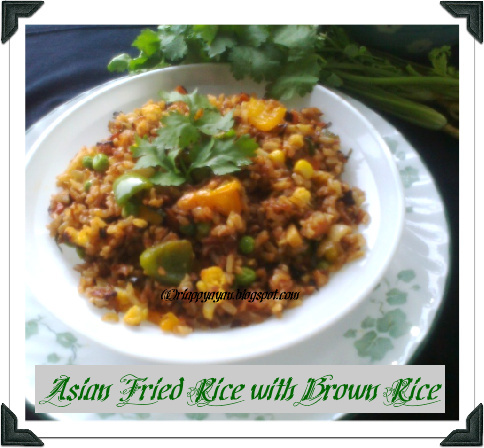 yes..brown rice is healthy and I too use it quite frequently as possible..looks delicious..
Wow wat a wonderful looking fried rice, simply awesome..
nice post and the rice looks swell ! Looks delicious and love that brown color.. Delicious and wholesome...just the way an ideal pot meal shud be!!! 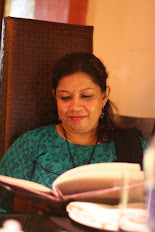 Love the amalgamation of your recipes....Following You! !